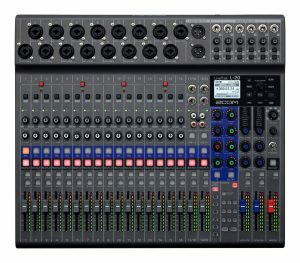 Zoom have announced the release of their new LiveTrack L-20 mixer, promising many new extra features, building on their concept first introduced with the L-12. Take a first look at the key new features of the LiveTrak L-20. With six independent Monitor Outputs, each musician can have its own custom mix, now complete with effects and easily switchable from headphone output to balanced line output for stage monitors. 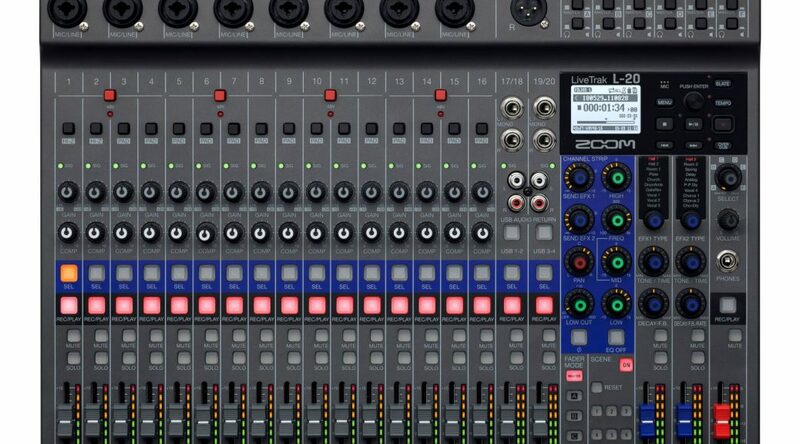 In addition, L-20 provides a dedicated headphone output for FOH (front-of-house) to enable monitoring of each custom mix and master out from the console. L-20 offers two Effects section for total of 20 built-in EFX with adjustable parameters. For maximum flexibility, now you can easily assign one Effect section to the Monitor mixes while the other section is assigned to the Master output. To enhance its effective operation from a distance, L-20 offers wireless control* via its own app for iPad featuring Fader Levels and Modes, Scenes, EQ parameters and more. Now you can even manage your EFX and Scene Library right from your iPad. *Optional Zoom Bluetooth LE Adapter (BTA-1)is required. Pre Orders Being Taken Now With Stock Arriving in September.